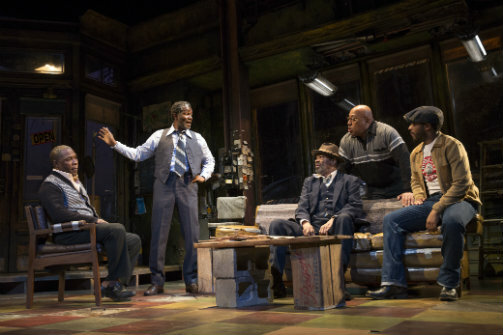 Michael Potts, John Douglas Thompson, Anthony Chisholm, Keith Randolph Smith, and André Holland in Jitney. Photo by Joan Marcus. BOTTOM LINE: A historic, deeply relevant, and beautifully presented production of August Wilson’s tenth and final Broadway premiere. Set in 1977, August Wilson’s Jitney follows a band of drivers as they joke, jab, and hustle in Pittsburgh’s Hill District. Becker (John Douglas Thompson), the jitney station owner, pulls the central focus as he grapples with the city’s threats to board up the station, as well as his son Booster’s (Brandon J. Dirden) release from jail after committing an unforgivable crime. Simultaneously, Wilson engages us in the full ensemble: We follow Youngblood’s (André Holland) attempts to buy a new house under the GI Bill as a surprise for his girlfriend, Rena (Carra Patterson). We roll our eyes at Turnbo (Michael Potts), always getting his nose in other people’s business and causing trouble. Our hearts break for Fielding (Anthony Chisholm) who remains a beacon of optimism despite his alcoholism. And the drivers’ friends, Philmore (Ray Anthony Thomas) and Shealy (Harvey Blanks), pop into the station to do business and mess around while Doub (Keith Randolph Smith) looks on, shaking his head. In order to fully appreciate the play, it’s important to note two important historical facts about the Hill District community: for decades, Pittsburgh city cabs refused to serve riders living in the low-income, predominantly African-American Hill District. This made jitneys particularly vital right around when Jitney takes place, near the beginning of a thirty-year period when the Hill had no neighborhood grocery store. On top of that, the city’s never-completed Hill revitalization plans from the 1950s left half of the original neighborhood decimated. The city’s plans to board up Becker’s jitney station is a threat to the drivers’ ability to work, to Hill residents’ way of getting around, and to the vitality of the community itself. Jitney is a must-see for its artistic merit as well as the production’s significance: despite being the first "Century Cycle" play Wilson wrote, it is the last play in the cycle to run on Broadway. And Manhattan Theatre Club couldn’t have picked a better company, including many Century Cycle veterans, to round out Wilson’s Broadway legacy. Tony-winner Ruben Santiago-Hudson’s direction is seamless, and his staging is authentically rooted in Wilson’s casual, yet heightened and highly poetic world (no surprise from the man whom Wilson singled out himself to direct the Cycle). Of course, the tight ensemble deserves as much credit: Thompson’s Becker maintains a quiet gravitas as he leads with love and keeps his head buried in his work. Turnbo is infuriating with his busybody motor mouth and sleazy tactics, but Potts makes the character complex, relatable and compelling instead of an easy-to-hate caricature. Smith succeeds in grounding the world as the jitney station’s "straight man"; with his effective setup and witty responses to foolishness, the secondary characters around him (particularly Blanks and Chisholm) keep us chortling throughout the drama. And Patterson brings a refreshing, much-needed perspective from a sure-footed woman to cut the rampant misogyny in the station. The challenge of designing for the Century Cycle lies in the fine balance between the Hill’s gritty realism and the magic that transcends that environment; this design team treads that line quite successfully. David Gallo’s scenic design hits on many of the key characteristics of the Pittsburgh neighborhood, with dramatic hills, aged and roughly furnished rooms, and a close proximity to neighbors (meaning anyone could be watching or listening to a private conversation anytime). Jane Cox’s naturalistic sunsets blend into more expressionistic lights for the final climax. Toni-Leslie James’ costumes offer a visual novel on each character’s sense of self and status. Bill Sims Jr.’s original music and Darron L. West’s sound design, featuring smooth jazz with a hint of rock guitar, play into both the period and the expressionistic magic behind Wilson’s words. Thomas Schall also should be noted for his fight direction that never ceases to surprise us, as arguments turn from simmering to scalding in a heartbeat. Still, the star of Jitney is Wilson himself, and the beautifully provocative language that has earned him the title "America’s Shakespeare." He paints a world where joy survives while the threat of tragedy is omnipresent. And though the Century Cycle is meant to preserve African-American social conditions of the 20th century, so many of Wilson’s words on pride, justice, honor, deliverance, love despite all odds, and forgiveness speak to audiences across cultures today. Wilson’s poetry is making a particularly strong comeback this year, between Jitney on Broadway, Fences in cinemas, and regional productions scattered across the country. This is hardly a surprise at a time when many Americans feel the nation's values being threatened. Wilson's canon is not only gorgeous art, but a vital recounting of American history that we need more than ever right now. MTC’s Jitney is a beautiful celebration of Wilson’s legacy. Jitney is written by August Wilson. Directed by Ruben Santiago-Hudson. Set Design is by David Gallo. Costume Design is by Toni-Leslie James. Lighting Design is by Jane Cox. Sound Design is by Darron L. West. Original Music is by Bill Sims Jr. Hair and Make-Up Design is by Robert-Charles Vallance. Fight Direction is by Thomas Schall. Production Stage Manager is James Latus. The cast is Harvy Blanks, Anthony Chisholm, Brandon J. Dirden, André Holland, Carra Patterson, Michael Potts, Keith Randolph Smith, Ray Anthony Thomas, and John Douglas Thompson.